Making a meal with a refrigerated pie crust is too easy, too acceptable … and too appealing. It’s cheating, of course, but in a good way. 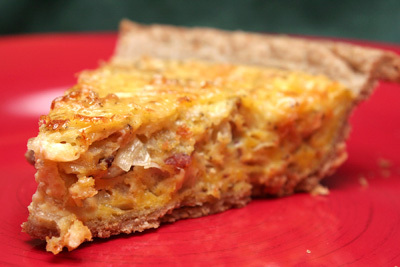 The recipe for “A Quiche Like Lorraine,” from theperfectpantry.com, boasts strong bacon flavor and was easy to gobble up. As I admitted, I happily used an organic whole-wheat 9-inch pie shell. I fried a bit of uncured smoked duck bacon and a bit of dry sausage, even, for 5 minutes. I did use Greek yogurt and Gruyère cheese. If your diners eat eggs, this is a dish you should definitely make once in a while. 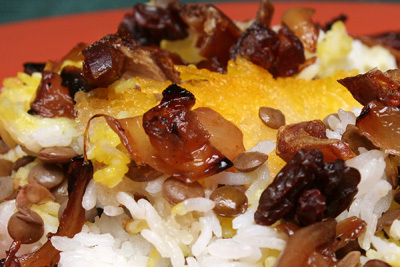 I also made the “Persian Rice and Lentils, ” from allrecipes.com: an enjoyable pilaf, with crispy bits that kept me interested. Notice you’ll have a few prep steps for this dish. First, you’ll need to soak your rice for three hours. The recipe’s amounts of water -- to cook the rice and the lentils -- were exact. You’ll cook the rice and the lentils and the onions separately. I did not layer my rice and lentils in a nonstick pot, yet my 2 Tbsp. vegetable oil at the bottom of my pot enabled my crispy bottom anyway. Once I poured the saffron water on top, I was mesmerized by its distinct flowery scent. The chopped dates, raisins, and sweet fried onions added at the end were flavorful complexities. And the crunch: another great texture element. Next time I will cook the “Turkey Stew with Peppers and Mushrooms,” from simplyrecipes.com. See it when you return to my site on Monday, April 25.